Susanne presented two curatorial projects - Process as Paradigm and Urban Interface Berlin/Oslo - which both feature artworks in which process is an important element. Instead of producing an art object, the artists created a situation which would change over time. 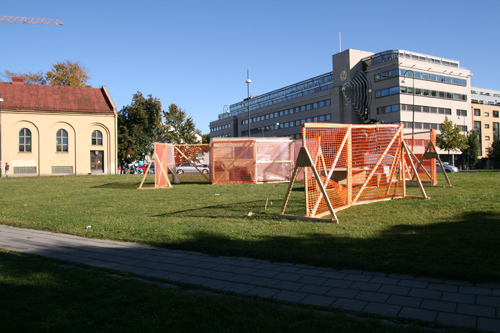 "Orange Works is an ongoing collaboration project, started in 2004, to build unauthorized temporary urban constructions camouflaged as in-process construction sites in order to probe existing spatial pressures, and reorganize public spaces to allow for new social uses." The installation tackles questions of control, surveillance, transparency, permanence and the role of the public. A high wall in the shape of a pentagon is erected on Vaterlandtorget square. It consists of a wooden frame with the sides covered in a material that will disintegrate during the course of the exhibition. Initially the wall is smooth, while the weather and the interactions of birds and passer-bys transform it over time. Writing on and penetration of the wall is encouraged. "The residents of an apartment block are invited to express their opinion publicly. On the basis of an initial contact with the residents in January 07, Department has developed the question “How do you look at your future?”. All residents of the apartment block are asked to answer this question. Department provides the residents with three so called “opinion carriers” which show different answers ranging from complete approval through to complete disapproval. These can be hung out of windows and enable the expression of personal views at the threshold between private and public space." 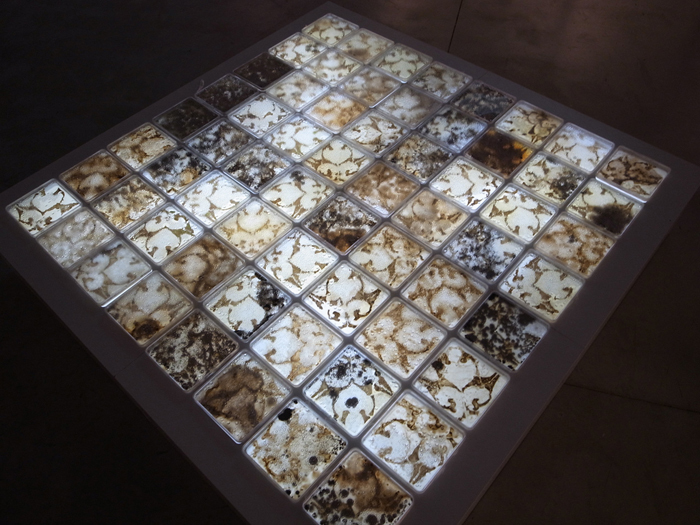 "In this piece, a living natural system takes on the form of a manufactured pattern. Leaves are intricately cut into a bilaterally symmetrical pattern and suspended in tiling square Petri dishes that contain the nutrients necessary to promote new leaf growth. 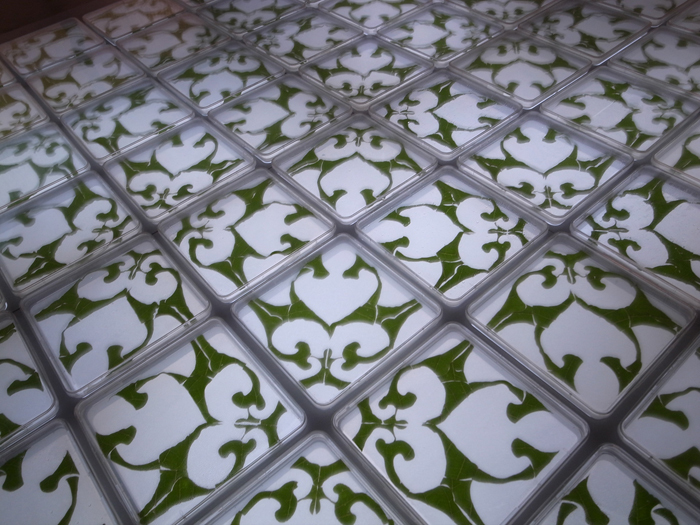 Since the cells of the plant have the capacity to differentiate into any organ in the plant, the newly growing leaves are extending the form of the traditionally inspired botanical motif. However, as with any experiment, it is possible for contamination to occur. In some, the tissue may die; in others, parasites may take over and grow faster than the leaves." 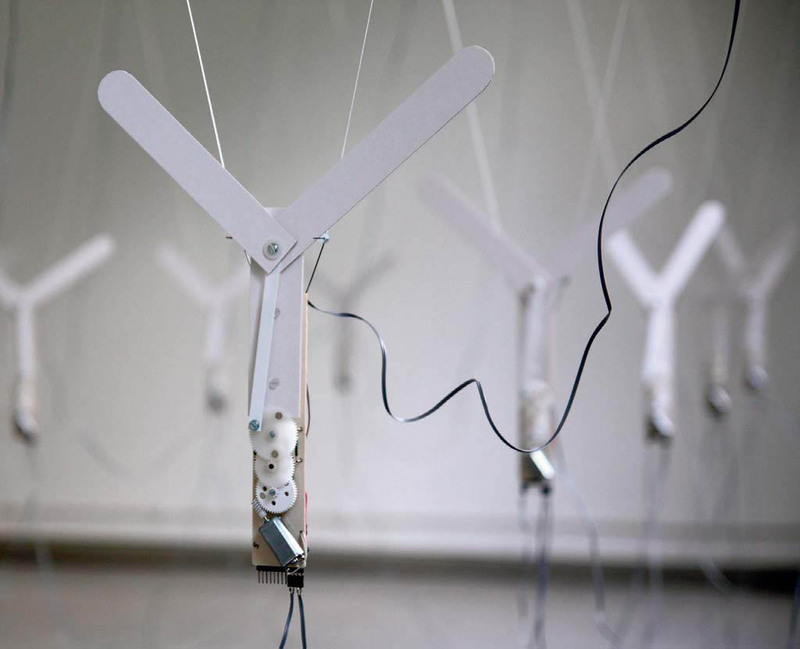 "The autonomous audio-kinetic installation consists of small minimalist robotic modules. The modules work autonomously on the basis of solar power, produce sounds and movements and interact with each other. Some modules combine both sound and movement and create fusions and a feedback of energies. The energy is reduced just to the level, at which something happens in the installation. This insufficient supply of energy however guarantees the modules’ unstable and altering behaviour and results in rhythmic and chaotically dense movement and sound patterns." 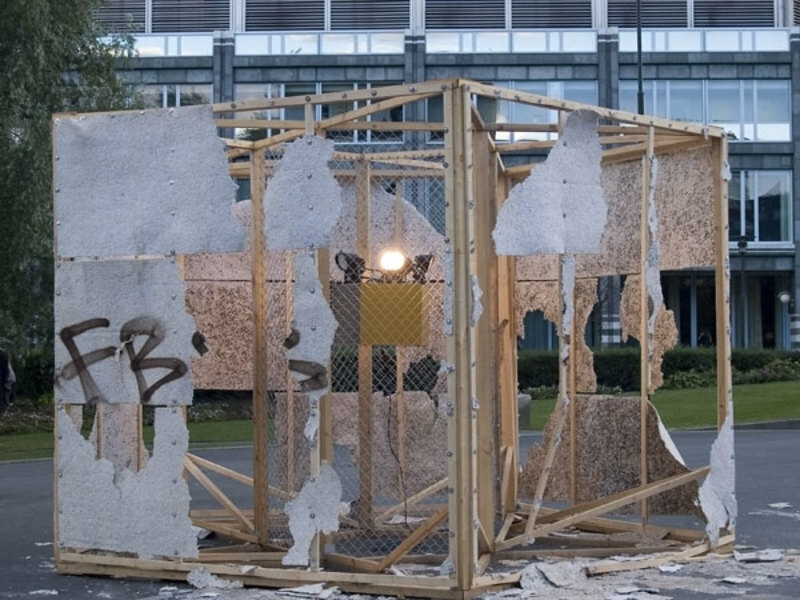 The introduction text to Process as Paradigm exhibition emphasises the point that in today's global society many processes seem to have gone out of control and we have to face radical uncertainty in many different fronts. Although the two artworks above behave in a chaotic, unpredictable manner, in my opinion they don't seem to touch this type of 'radical uncertainty'. The chaos in them calm, organic and peaceful disintegration. One response Susanne gave to this question is that some of the more unpredictable artworks simply had to be left out from the exhibition, due to limited in resources. There was also further discussion about this - about the issue that art institutions and art market don't seem to be able to offer room for this type of art, quite the contrary - artists and curators are asked to produce work in an increasing speed, and also work that would be easy to sell, making it difficult to realise complex artworks. Susanne commented that many professionals have already found a way to adapt to this situation and have become experts in splitting projects into smaller pieces and steps that can be developed and presented on different occasions. It later occurred to me that the two artworks Susanne chose to present (Growth Pattern and Living Particles) were quite peculiar examples - the chaos in them is actually very stable. This is related to the fact that many systems in nature are chaotic yet stable - such as our lungs or blood circulation system. A tiny failure in these non-linear systems will not cause a complete crash, they are very flexible in adopting to new situations. More information about this topic can be found for example from a classic book by James Gleick: Chaos. The chaos and uncertainty we experience in society might be of opposite nature, resulting from conflicting rigid systems which are unable to change and adapt. The Process as Paradigm exhibition has a wide range of different artworks and some of them also reflect on this type of chaos, either in a concrete or in a more poetic way. See for example Antidatamining, Real snail mail or Still living.